Where were you during the "Quartz crisis" of the 1970s? Probably mourning The Beatles and fretting over bigger world events - unless you were part of Switzerland's collapsing mechanical watch industry. It was a bad time to be a Swiss watchmaker: quartz had turned the industry upside down and outsourced the lion's share of production to Asia. Then Swatch showed up on the scene and spearhead a fashion watch revolution through the 80s, helping an ailing industry to rebound. Swatch watches were fashionable and, just as importantly, affordable. They wore their unapologetically brash designs loud and proud, and people loved it. Jump to 2018 and the watch industry is facing its next big reckoning: the smartwatch. And you know who I think can save the day again? You guessed it. 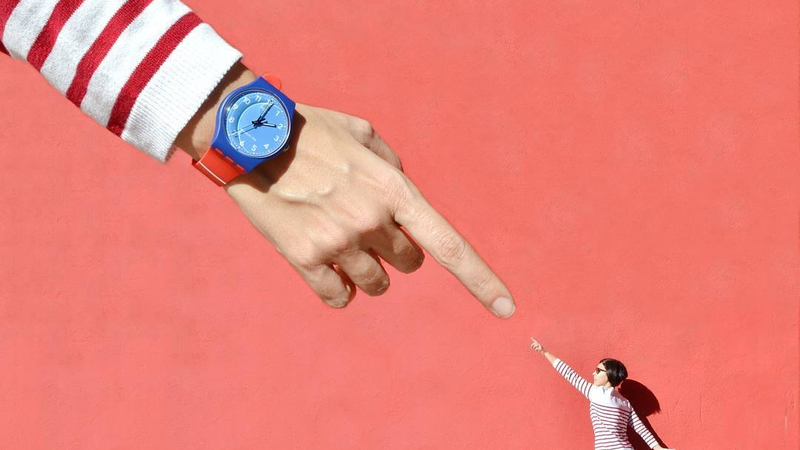 We know that Swatch has something big in the works. Last year, company CEO Nick Hayek said that Swatch will launch its own smartwatch operating system, dubbed Swiss OS, in 2018. The software, he said, will be lighter on both updates and battery drain. But Swiss OS could also throw a lifeline to the fashion brands being let down by Google's half-hearted wearable ambitions. Android Wear is failing to keep pace with the companies it's supporting, and Swatch could offer an alternative. I know what you're thinking: Swatch and Fossil are technically competitors, so why the hell would they work together? Simply because it could be mutually beneficial for both. And unless Fossil makes its own software or Google pulls its socks up, it may become a matter of necessity. Swatch is smart to be making its own operating system; it'd be even smarter to license it to the rest of the industry. Especially as some of the world's biggest watchmakers are starting to see the rewards of the connected reality: smartwatches account for 12% of Frederique Constant's revenue right now; Fossil, the most fervent champion of wearables is finally benefiting too. But they're being held back by software that should be a lot better than it is. We might not be quite at Quartz Crisis 2.0 yet, but the doomsday watch is edging closer to midnight. Switzerland can no longer laugh off the threat of the smartwatch: in Q4 of last year Cupertino was estimated to have outsold the entire Swiss watch industry, but it needs competition. Wareable editor Mike Sawh recently asked whether Google still cares about Android Wear. I think it does, but it doesn't affect the company's bottom line, nor does it push people to their smartphones the way the Watch does for Apple. It could easily kill Android Wear tomorrow with few repercussions. But Swatch has a lot more reason to care, and a history of shaking things up. It's time to disregard Swiss neutrality and hit Apple where it hurts. If Samsung wants to increase the appeal and build 3rd-party app support, it would make sense to pursue partnerships and get Tizen onto more wrists.